Mertz Manufacturing is dedicated to providing exceptional experiences for all our customers, as well as great career opportunities for employees. As part of our ongoing commitment to excellence, we are committed to continuously improving the workplace, we do this by recruiting, promoting and retaining top talent. We invite you to take a look at Mertz Manufacturing’s employee benefits and programs below. Then click the box that most closely fits the type of position you’re looking for at Mertz Manufacturing for more information. 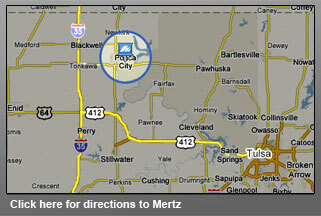 Our corporate offices are located in Ponca City, Oklahoma, located about equidistance from Oklahoma City, Tulsa and Wichita, Kansas. Click here to contact us. We offer benefits designed to improve the quality of life for our employees and their families. Having troubles? The employment application requires the free Adobe Acrobat Reader.